Executive producers Scott Rosenbaum and Chris Morgan, as well as Director Allen Hughes sat down to discuss how their show “Gang Related” will change the way people not only view the police, but Los Angles as a whole. Q: I saw the pilot episode and I was kind of curious where the idea came from and what fans can expect for the rest of the season as the rest of the episodes start airing? Morgan: Basically the idea came from a police dash cam video and – I mean, I guess I’ll just run through it really quick. Basically it came from a police dash cam video of police officers responding to a man with a gun call. So the cops show up and they’re confronted by a guy with an AK-47, and the cops, as good as they are and even though they vastly outnumbered him, they could not get in to stop this guy. And when they reviewed the video later, this guy ended up they looked and he was using a military technique called slicing the pie, which is he barely exposes himself and he opens a wider field of fire and he becomes a really hard target. What they deduced from that was this was gang member who was sent by his gang into the military to become a real fighter for the street – an enforcer. That made me start thinking if they’re sending people into the military, where else would gangs be sending people. The world has changed, and they are becoming very sophisticated organizations – what else are they sending people into. When we pick him up, he’s at this moment in his life where he’s conflicted for the first time about what he’s doing. Just speaking to the world and all that – can I just tell you what I love about the show? I think there’s a great, large world here. In fact, our show does something that no other show I’ve seen, or at least that I can think of right now, does. We have one episode coming up in mid-season where we have four huge dramatic scenes – very long dramatic sequences between characters, back to back. Q: You guys did this great job of bouncing back and forth between what happened and what you thought was going to happen, didn’t happen. There were so many twists and turns in it. Is that what’s going to continue throughout the season? Morgan: That’s exactly the goal. Q: My mind was blown by the time the episode was over. Hughes: The script, obviously, was just already amazing and the team was amazing. Scott was amazing. We all were on set as well as Francie Calfo from Imagine Entertainment, and I found what was most difficult, and I never had this challenge in my career was Ramon’s job of doing what you just said – it’s on the page. But just because it’s on the page – how do you play that? Hughes: He has to do several things. He has to be this way with his family and this way with this family, and he’s got to be revealing to the audience something within that, too. So there’s several layers for an actor where he’s constantly got to be appearing or disappearing or reappearing – he’s an allusion at all times. And for an actor, for Ramon, I remember, it took all of our eyes – and it was on the page. It was written on the page, but once you get three dimensions – it’s really flesh. You’re dealing with real people and talent and you’re shooting. I think Ramon did a remarkable job. There’s a beauty and an edge and a pain in him innately, anyway, and an intellect that’s profound. I think that even with all his gifts, it took us all to watch every Michael moment to make sure that what you’re talking about was pulled off, and that was the most difficult challenge I thought. Rosenbaum: You bring up a really good point, Allen, which is – we’ve said it to Ramon a lot, which is he has the most difficult acting job if you really drill down on it. Because, you’re absolutely right – in every scene he’s only revealing to the audience what he’s really feeling, but everybody else there’s a veneer that’s on top of it that he has to deliver. It’s really, really difficult. I think you did an excellent job getting him – helping him out with it. That was awesome. Q: The show seems very cinematic to me. It’s like a mini-movie. Hughes: There’s no sense in doing it if we’re not doing cinema. Scott made that clear. Chris made that clear to me when they hired me. They said we’re not trying to make any regular television show. One, we want to do something different. We want to elevate it. We want it to be cinematic, and we want it to have – be visceral, have energy, have a sound on the field. These are mandates before I even came on to the project. To tell you the truth, I’ve done several features, and I’ve never been auditioned and had more meetings to get a job … They were very clear about what they were looking for and that made it easy for me because I’m just a cinema guy and you guys want me to do cinema on television, oh, that’s just 1-2-3, let’s do it. 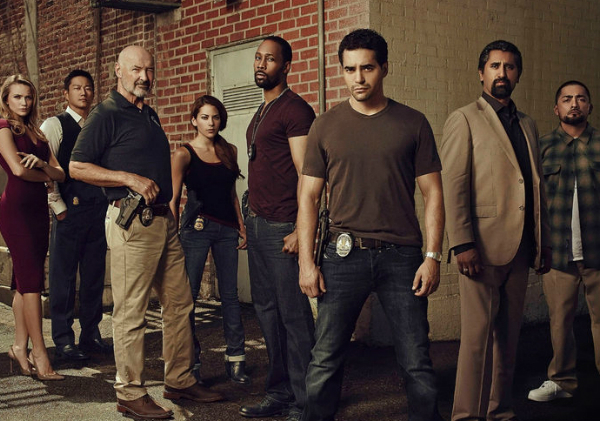 Check out “Gang Related” on FOX Thursday, May 22 at 9 p.m. EST.